This casual contemporary sofa table will add great style and functionality to your living room, great behind a sofa in your living room seating group or next to a wall in your hallway or transitional space. The arched sides with open grids offer a subtle and sophisticated mission influence, with a casual contemporary twist. A large lower shelf offers lots of space for decorative items, so you can add your own personal touch to your room. 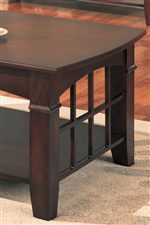 In a dark Cherry finish, this sofa table is sure to complement your decor and create a warm and inviting look in your living room. The Abernathy Sofa Table with Shelf by Coaster at Furniture Discount Warehouse TM in the Crystal Lake, Cary, Algonquin area. Product availability may vary. Contact us for the most current availability on this product. The Abernathy collection is a great option if you are looking for Casual furniture in the Crystal Lake, Cary, Algonquin area. Browse other items in the Abernathy collection from Furniture Discount Warehouse TM in the Crystal Lake, Cary, Algonquin area.